A nice surprise from the USHL today as they posted the updated protected rosters of all USHL teams this afternoon. Click here to see the rosters. I am going to post Lincoln's 25-player protected roster and affiliate list below. After that, I will dissect each roster a bit and highlight the players no longer protected, and those new players who have been protected. The players noted below are in no particular order. A quick reminder, USHL teams can roster (4) overagers (players born in 1993) this next season, and (4) imports. Imports are players born outside of the United States. It appears right now that Lincoln's four overagers next season will be Bitzer, Kolquist, Simonson, and Hoff. The only big surprise that I see is the omission of Moorhead, MN goaltender Jacob Dittmer. Dittmer ('96) was selected by the Stars in the 2013 USHL Entry Draft, and looked great at tryouts this past June. Dittmer is about to start his junior season at Moorhead, so he still has a season or two before getting to the USHL level. I figured that Dittmer would be a goaltender the Stars would want to protect for the next couple of seasons, but apparently that's not the case. Very surprised at his omission. Tony DeVito and Scott Dornbrock were free agents at Lincoln's tryout camp, and played well enough to earn a spot on the first protected roster. The Stars must have decided to go in another direction regarding those two. Best of luck to those two going forward. Cody Pettapiece was a draft pick of the Stars, but he was a no-show at their tryout camp. No surprise that he isn't on the latest roster. Nate Repensky had his USHL rights sent to the Sioux City Musketeers in the trade for Christian Lampasso. Interesting side story to that trade, Repensky decided to not report to Sioux City and instead will play for the Bismark Bobcats (NAHL) next season. Regarding the forwards, ZAR was called up by Northeastern University a year early due to a forward leaving the Huskies for the NHL. Michael Bunn will play for the Connecticut Oilers (EJHL) this next season, and Alex Forsberg will play for the Prince George Cougars of the WHL. Again, no surprises at all there. From the affiliate list, only forward Casey Linkenheld was not included on this roster compared to the one released on 7/10. Linkenheld was a 2013 Entry Draft pick of the Stars. Vershay was acquired from the Waterloo Blackhawks for a 3rd round pick in the 2014 Phase 1 (Futures) draft. Lampasso was acquired from the Sioux City Musketeers for defenseman Nate Repensky, and a 5th round conditional draft pick in the 2015 Futures draft. Callin was acquired from the Des Moines Buccaneers for "future considerations." Ivey is a recent free agent acquisition by the Stars after he was released by the Tri-City Storm (the team he played for last two seasons). There are some players on the Stars' affiliate roster that are already in Lincoln, including Thomas Carey and Keegan Ward. Ward (born in 1997) will likely be the youngest player on Lincoln's roster next season. Players going to high school normally play the entire season and cannot be released or moved. Ward falls into that category. I believe Daniel Willett, Jonathan Desbiens, and Tommy Marchin are also attending high school as well. So the Stars will have more than the 25 players listed above at their training camp the next 3-4 weeks. 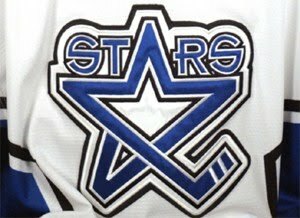 A lot of USHL teams, including the Stars, will have players from their affiliate list at training camp, along with players who aren't included above. Per the USHL, "a player is protected if he is attending a specific team's training camp. There will be players not located on the current 25 man rosters who are still protected by a USHL team." Along with netminder Michael Bitzer and Nick Schmit, it appears that Canadian goaltender Jake Ireland is in town attempting to make the team. Click here to see his tweet. For now, it appears Schmit and Ireland will be battling it out to see who will be Bitzer's backup. It would not surprise me to see other players in town attempting to make the team who are not included on the protected rosters above. Lincoln will have the next 25 days or so to practice and play a total of five preseason games before opening the 2013-14 regular season on Friday, September 27th against the Cedar Rapids Roughriders at the IceBox. The 25-player protected roster will have to get cut down to 23 players before opening night, so there is still a lot of roster juggling ahead. That's enough rambling from me. Thoughts on the protected roster? Comments are wide open.